Abstract. Autophagy is a potent intracellular degradation system and thus its activation requires exquisite regulation to maintain cellular homeostasis. Atg1, a serine-threonine protein kinase, is essential in both selective and non-selective autophagy. New findings suggest that in selective autophagy, Atg1 is activated at the vacuole by convergence of two independent recruitment pathways to prevent aberrant autophagy induction. Background and Significance. Autophagy is a powerful cellular degradation pathway that responds to various cellular stresses such as nutrient starvation (Takeshige et al., 1992). In addition to the non-selective bulk autophagy, there are selective types of autophagy that are finely regulated by specific cargo receptors, which link cargos to the autophagic machinery (Scott et al, 2001; Chang and Huang, 2007; Stolz et al., 2014). One clear example of selective autophagy in yeast is the cytoplasm-tovacuole (Cvt) pathway, which is responsible for the delivery of the hydrolase aminopeptidase 1 (Ape1) from cytosol to the vacuole (Baba et al., 1997; Shintani and Klionsky, 2004; Nakatogawa et al., 2009). Autophagy is controlled by highly conserved autophagy-related (Atg) proteins, of which 15 proteins are commonly required for both non-selective and selective autophagy (Tsukada and Ohsumi,1993; Klionsky et al, 2003; Nakatogawa et al., 2009). Atg1, a serine and threonine protein kinase, plays an essential role in both starvation-induced autophagy and Cvt pathway, and its activity is positively regulated by Atg13, the other protein involved in both autophagy pathways (Funakoshi et al, 1997; Matsuura et al, 1997; Kamada et al, 2000). However, how the cell activate Atg1 kinase activity in space and time still remains unclear. Atg11, a critical protein for selective autophagy in yeast, functions as a scaffold protein that interacts with cargo receptor Atg19 for the Cvt pathway (Scott et al, 2001; Yorimitsu et al, 2005; Shintani and Klionsky, 2004; Nakatogawa et al., 2009). Atg19 interacts with both cargo protein Ape1 and scaffold protein Atg11 to bridge Ape1 to Atg11. Atg11 interacts with other early members of the autophagic machinery including Atg1 at the pre-autophagosomal structure (PAS), the initial site for Atg proteins recruitment, allowing subsequent Cvt vesicle formation and autophagy induction (Shintani and Klionsky, 2004). How Atg11 and cargo receptors interact with the early autophagic machinery, especially Atg1, to coordinate cargo degradation remains elusive. In this issue of Molecular Cell, Torggler et al apply an induced bypass approach (iPass) in yeast to elucidate the mechanism by which Atg13 and cargo complexes cooperate in two independent pathways to activate spatiotemporally Atg1 in the selective autophagy pathway. Atg1 and cargo complex are recruited to the vacuole by two divergent processes to activate Atg1. In the Cvt pathway, cargo receptor Atg19 bridges the Ape1cargo to the scaffold protein Atg11, which is required to recruit the autophagic machinery to the PAS (Shintani and Klionsky, 2004; Nakatogawa et al, 2009). To address the precise function of the cargo receptor, Torggler et al developed a fancy tethering technique called iPass. In iPass, the authors directly linked cargo 2 protein Ape1 to Atg11 through chemically induced dimerization. If the cargo receptor only serves to bridge the cargo to Atg11, then iPass should restore the Cvt pathway even in the absence of the cargo receptor. By using iPass, Torggler et al revealed that the cargo receptor Atg19 can be bypassed by tethering Atg11 to Ape1 to function in Cvt pathway. Next they tested weather other autophagy receptors can be bypassed, and by iPass they found that in pexophagy, the cargo receptor Atg36 could also be bypassed by directly tethering Atg11 to peroxisome protein Pex3. Taken together, the authors determined that cargo receptors Atg19 and Atg36 could be bypassed by directly tethering Atg11 to the cargo to induce selective autophagy, indicating that the only non-redundant role of the cargo receptor is to link the cargo to thescaffold protein Atg11. Because of the importance of Atg11 in recruiting the early autophagic machinery Atg1, Atg13, and Atg17 to PAS (Shintani and Klionsky, 2004), Torggler et al further investigated the relationship between Atg11 and Atg1 kinase complex. By immunoprecipitation of Atg1, the authors found that Atg1 co-purified with Atg13, Atg11, Atg19, and Ape1. Of which, Atg13 is a well-established activator of Atg1, and Atg11, Atg19 and Ape1 were suggested recently to function in Atg1 activation (Kamber et al., 2015). Next by immunopurification of Atg1 in different mutant strains followed by in vitro phosphorylation assays, they identified that loss of Atg11 or the cargo complex Atg19 or Ape1 attenuated Atg1 kinase activity to a similar degree as loss of Atg13. However, how Atg1 interacts with the cargo complex was not revealed in this study. A common mechanism of kinase activation has been proposed whereby serine/threonine kinases are activated by dimerization or oligomerization followed by trans-autophosphorylation (Oliver et al., 2007). Atg1 is a member of the serine-threonine protein kinase family, thus the authors speculated that Atg1 is activated by dimerization or clustering on cargo, which induces trans-autophosphorylation and activation. In this study, the authors applied iPass to verify this hypothesis and demonstrated that clustering was sufficient to activate Atg1 kinase, and Atg11, Atg13, and cargo complex were not specifically required. Furthermore, iPass enabled the authors to observe that Atg1 only clustered on cargo complexes that are attached to the vacuole, which altogether allow regulation of Atg1 activation in space and time, and thus exquisitely control of Cvt vesicle formation (Figure 1). Although binding of Atg13 to Atg1 to activate Atg1 kinase activity has been extensively studied in selective autophagy, no one indicated the precise role of Atg13 in activating Atg1. Here the authors used iPass to show that the crucial function of Atg13 in the Cvt pathway was only the recruitment of Atg1 to the vacuole and this function could be bypassed by chemical linkage. This is striking since Atg13 has long been viewed as main regulator of Atg1 activity. Next, using M-track to monitor the proximity of Atg1 and vacuolar components, the authors suggested that Atg1 and cargo complexes are recruited to the vacuole by two independent processes (Figure 1). Atg1 recruitment itself depends on Atg13, but not on cargo (Figure 1). However, upon recruitment to the vacuole, the activation of Atg1 kinase requires its association with cargo complexes that are recruited by Atg11 (Figure 1). Concluding remarks and future directions. Here the authors demonstrated that in the Cvt pathway Atg13 and Atg11 function independently, but converge to recruit Atg1 and cargo complexes, respectively, and then coordinate the activation of Atg1 at the vacuole. This two-step system allows the cell to tightly control Atg1 activity in space and time, and thus fine-tune autophagosome formation in selective 3 autophagy (Figure 1). Despite of the clear mechanism for Atg1 activation at the vacuole, several important questions remain to be addressed. Why is Atg1 unable to bind to Atg11 cargo complexes away from the vacuole? Is the Atg1 activation mechanism conserved in mammalian cells? What are the mechanisms underlying the pathogenesis of autophagy-related diseases? Combined with further dissection of the protein interaction network during autophagosome formation and the newly developed techniques, these questions will be addressed in the future. Figure 1. A two-step system activates Atg1 kinase activity at the vacuole in the Cvt pathway. 1. Atg1 is recruited by Atg13 to the vacuole; 2. 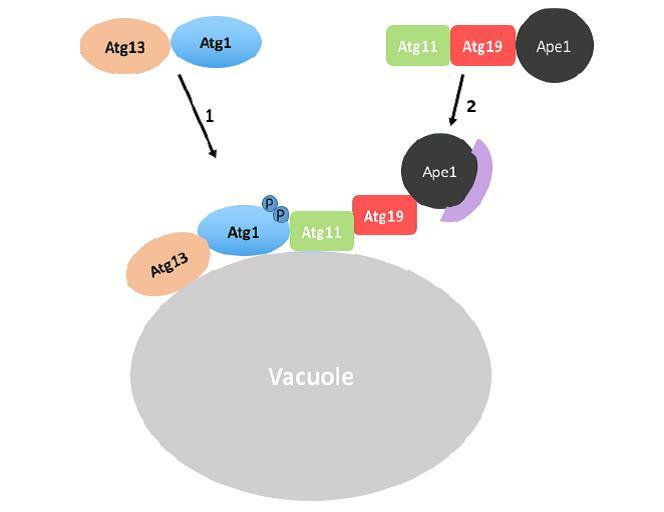 The cargo receptor Atg19 bridges cargo Ape1 to the scaffold protein Atg11, which is independently recruited to the vacuole. At the vacuole, Atg1 is activated by phosphorylation through clustering on the cargo complex, which triggers autophagosome formation. These two independent steps ensure activation of Atg1 in space and time. for targeting proteins from the cytoplasm to the vacuole/lysosome. The Journal of cell biology, 139(7), 1687-1695.
mechanism in selective autophagy. Molecular biology of the cell, 18(3), 919-929. Funakoshi, T., Matsuura, A., Noda, T., & Ohsumi, Y. (1997). Analyses of APG13 gene involved in autophagy in yeast, Saccharomyces cerevisiae. Gene, 192(2), 207-213. Kamada, Y., Funakoshi, T., Shintani, T., Nagano, K., Ohsumi, M., & Ohsumi, Y. (2000). Tormediated induction of autophagy via an Apg1 protein kinase complex. The Journal of cell biology, 150(6), 1507-1513.
autophagy use a Scaffold protein to activate the Atg1 kinase. Molecular cell, 59(3), 372-381. Y. (2003). A unified nomenclature for yeast autophagy-related genes. Developmental cell, 5(4), 539-545.
required for the autophagic process in Saccharomyces cerevisiae. Gene, 192(2), 245-250.
autophagy mechanisms: lessons from yeast. Nature reviews Molecular cell biology, 10(7), 458-467.
mechanism of kinase autophosphorylation? Trends in biochemical sciences, 32(8), 351-356.
the cytoplasm-to-vacuole targeting pathway. Molecular cell, 7(6), 1131-1141. Stolz, A., Ernst, A., & Dikic, I. (2014). Cargo recognition and trafficking in selective autophagy. Nature cell biology, 16(6), 495-501.
demonstrated with proteinase-deficient mutants and conditions for its induction. The Journal of cell biology, 119(2), 301-311. Torggler, R., Papinski, D., Brach, T., Bas, L., Schuschnig, M., Pfaffenwimmer, T., … & Kraft, C. (2016). Two Independent Pathways within Selective Autophagy Converge to Activate Atg1 Kinase at the Vacuole. Molecular Cell, 64(2), 221-235.
mutants of Saccharomyces cerevisiae. FEBS letters, 333(1-2), 169-174. Yorimitsu, T., & Klionsky, D. J. (2005). Atg11 links cargo to the vesicle-forming machinery in the cytoplasm to vacuole targeting pathway. Molecular biology of the cell, 16(4), 1593-1605.